Calculate power by calculating changes in energy over time. Examine power consumption and calculations of the cost of energy consumed. Power—the word conjures up many images: a professional football player muscling aside his opponent, a dragster roaring away from the starting line, a volcano blowing its lava into the atmosphere, or a rocket blasting off, as in Figure 1. These images of power have in common the rapid performance of work, consistent with the scientific definition of power as the rate at which work is done. Because work is energy transfer, power is also the rate at which energy is expended. A 60-W light bulb, for example, expends 60 J of energy per second. Great power means a large amount of work or energy developed in a short time. For example, when a powerful car accelerates rapidly, it does a large amount of work and consumes a large amount of fuel in a short time. Figure 2. When this woman runs upstairs starting from rest, she converts the chemical energy originally from food into kinetic energy and gravitational potential energy. Her power output depends on how fast she does this. The work going into mechanical energy is At the bottom of the stairs, we take both and initially zero; thus, where is the vertical height of the stairs. Because all terms are given, we can calculate and then divide it by time to get power. 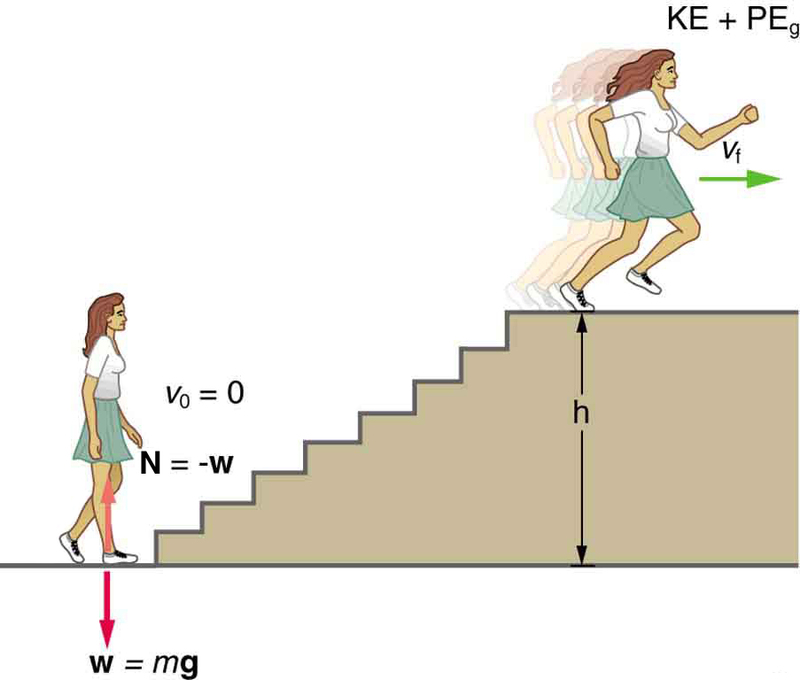 The woman does 1764 J of work to move up the stairs compared with only 120 J to increase her kinetic energy; thus, most of her power output is required for climbing rather than accelerating. It is impressive that this woman’s useful power output is slightly less than 1 horsepower People can generate more than a horsepower with their leg muscles for short periods of time by rapidly converting available blood sugar and oxygen into work output. (A horse can put out 1 hp for hours on end.) Once oxygen is depleted, power output decreases and the person begins to breathe rapidly to obtain oxygen to metabolize more food—this is known as the aerobic stage of exercise. If the woman climbed the stairs slowly, then her power output would be much less, although the amount of work done would be the same. Determine your own power rating by measuring the time it takes you to climb a flight of stairs. We will ignore the gain in kinetic energy, as the above example showed that it was a small portion of the energy gain. Don’t expect that your output will be more than about 0.5 hp. Table 3. Power Output or Consumption. Electricity bills state the energy used in units of kilowatt-hours which is the product of power in kilowatts and time in hours. This unit is convenient because electrical power consumption at the kilowatt level for hours at a time is typical. Cost is based on energy consumed; thus, we must find from and then calculate the cost. Because electrical energy is expressed in at the start of a problem such as this it is convenient to convert the units into and hours. The cost of using the computer in this example is neither exorbitant nor negligible. It is clear that the cost is a combination of power and time. When both are high, such as for an air conditioner in the summer, the cost is high. The motivation to save energy has become more compelling with its ever-increasing price. Armed with the knowledge that energy consumed is the product of power and time, you can estimate costs for yourself and make the necessary value judgments about where to save energy. Either power or time must be reduced. It is most cost-effective to limit the use of high-power devices that normally operate for long periods of time, such as water heaters and air conditioners. This would not include relatively high power devices like toasters, because they are on only a few minutes per day. It would also not include electric clocks, in spite of their 24-hour-per-day usage, because they are very low power devices. It is sometimes possible to use devices that have greater efficiencies—that is, devices that consume less power to accomplish the same task. One example is the compact fluorescent light bulb, which produces over four times more light per watt of power consumed than its incandescent cousin. Modern civilization depends on energy, but current levels of energy consumption and production are not sustainable. 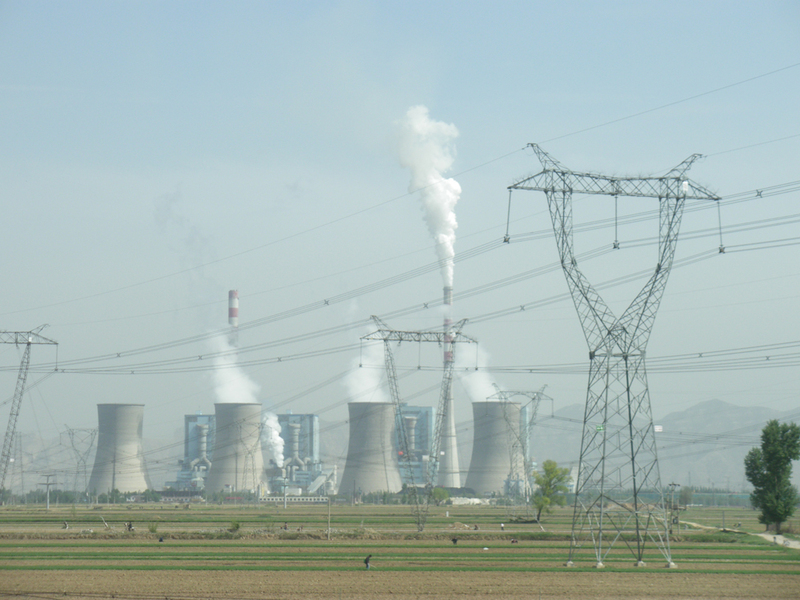 The likelihood of a link between global warming and fossil fuel use (with its concomitant production of carbon dioxide), has made reduction in energy use as well as a shift to non-fossil fuels of the utmost importance. Even though energy in an isolated system is a conserved quantity, the final result of most energy transformations is waste heat transfer to the environment, which is no longer useful for doing work. As we will discuss in more detail in Chapter 15 Thermodynamics, the potential for energy to produce useful work has been “degraded” in the energy transformation. 1: Most electrical appliances are rated in watts. Does this rating depend on how long the appliance is on? (When off, it is a zero-watt device.) Explain in terms of the definition of power. 2: Explain, in terms of the definition of power, why energy consumption is sometimes listed in kilowatt-hours rather than joules. What is the relationship between these two energy units? 3: A spark of static electricity, such as that you might receive from a doorknob on a cold dry day, may carry a few hundred watts of power. Explain why you are not injured by such a spark. 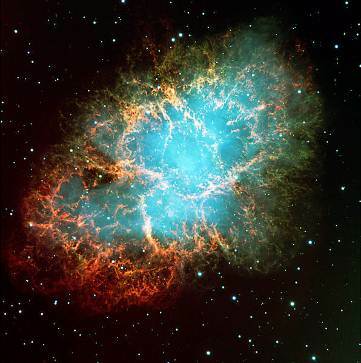 1: The Crab Nebula (see Figure 4) pulsar is the remnant of a supernova that occurred in A.D. 1054. 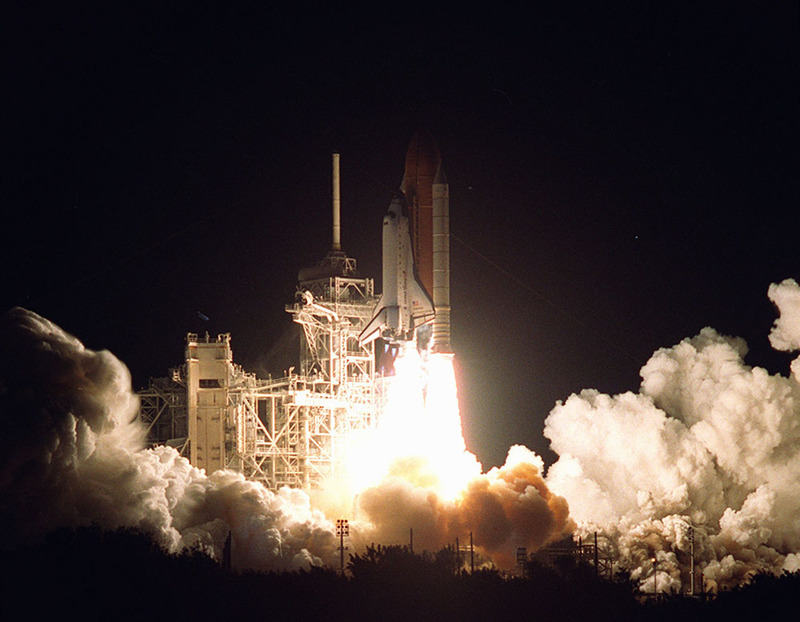 Using data from Table 3, calculate the approximate factor by which the power output of this astronomical object has declined since its explosion. 2: Suppose a star 1000 times brighter than our Sun (that is, emitting 1000 times the power) suddenly goes supernova. Using data from Table 3: (a) By what factor does its power output increase? (b) How many times brighter than our entire Milky Way galaxy is the supernova? (c) Based on your answers, discuss whether it should be possible to observe supernovas in distant galaxies. Note that there are on the order of observable galaxies, the average brightness of which is somewhat less than our own galaxy. 3: A person in good physical condition can put out 100 W of useful power for several hours at a stretch, perhaps by pedaling a mechanism that drives an electric generator. Neglecting any problems of generator efficiency and practical considerations such as resting time: (a) How many people would it take to run a 4.00-kW electric clothes dryer? (b) How many people would it take to replace a large electric power plant that generates 800 MW? 6: (a) What is the average power consumption in watts of an appliance that uses of energy per day? (b) How many joules of energy does this appliance consume in a year? 8: A 500-kg dragster accelerates from rest to a final speed of 110 m/s in 400 m (about a quarter of a mile) and encounters an average frictional force of 1200 N. What is its average power output in watts and horsepower if this takes 7.30 s? 9: (a) How long will it take an 850-kg car with a useful power output of 40.0 hp (1 hp = 746 W) to reach a speed of 15.0 m/s, neglecting friction? (b) How long will this acceleration take if the car also climbs a 3.00-m-high hill in the process? 13: Calculate the power output needed for a 950-kg car to climb a slope at a constant 30.0 m/s while encountering wind resistance and friction totaling 600 N. Explicitly show how you follow the steps in the Chapter 7.7 Problem-Solving Strategies for Energy. About 28 kW (or about 37 hp) is reasonable for a car to climb a gentle incline. 7.7 Power by OpenStax is licensed under a Creative Commons Attribution 4.0 International License, except where otherwise noted.